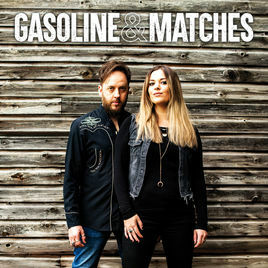 After topping the UK ITunes Country Chart, a headlining performance at The Hard Rock London and a five date Californian tour in the bag, Gasoline & Matches have released the video for ‘Fool’s Gold’, recently premiered on Your Life In A Song. Directed by the talented freelance filmmaker Jez Alsop, the idea was to create a simple performance style video to introduce the personality of Gasoline & Matches to the world. Shooting in this way gave opportunity to showcase both the musicianship and exuberant, humorous nature of Sally Rea & Steve Marks. Gasoline & Matches made a powerful impact on the UK scene last year. Following appearances at 2 of the UK’s premier country festivals, Buckle & Boots and FSA Fest, they received a nomination for Duo of the Year at the 2017 British CMA Awards alongside The Shires and Ward Thomas. With their undeniable chemistry on stage and their single recently airing on BBC Radio, this explosive duo are setting the UK Country scene alight!